Barcelona - Smart City Expo World Congress I OBJAVLJENO 19.12.2016. At the 6th Smart City Expo World Congress (SCEWC), as a business partner of HT (Croatian Telecom), a member of Deutsche Telecom group, EcoMobile presented its solutions for electronic tracking of waste collection and system for monitoring waste container fill levels. The event took place from 15 to 17 Novemeber at theGran Via Fira de Barcelonaexhibition centre where exhibitors from over 600 cities and five continents presented their Smart City solutions. 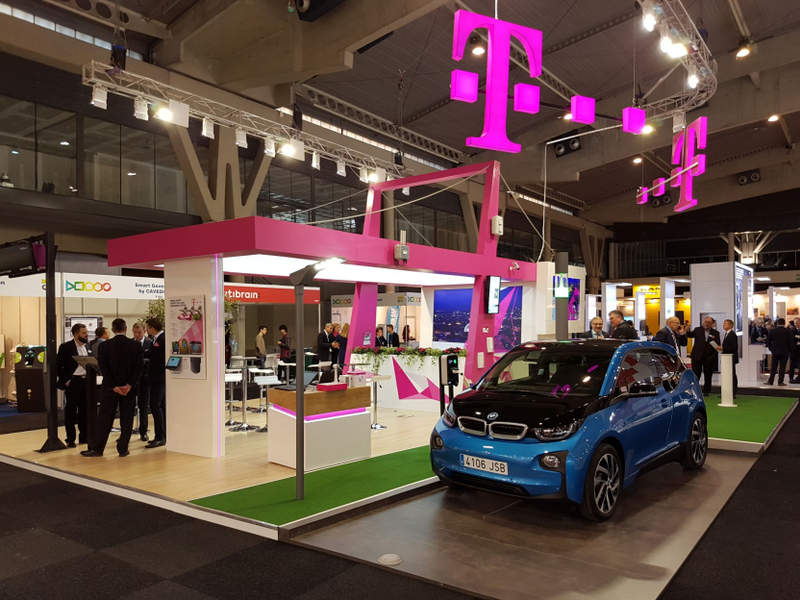 In its showroom (exhibition area) apart from our Waste Management solution and Sensor for monitoring container filling levels, Deutche Telekom presented a variety of interesting solutions and prooved itself as a leader in technology for providing Smart City solutions. Smart Street Lighting allows a city to adjust the street lights according to its specific needs and reduce its energy consumption. The system is equipped with sensors to enable greater energy savings and provides operational alerts to reduce maintenance costs. It also allows a city to generate detailed reports and optimize its savings from the street lighting system. Smart Parking is a solution for optimizing street parking in the city, saving drivers time, helping cities reduce traffic and CO2 emissions, while also enabling a better flow of traffic. Smart Public Safety increases both the perceived and actual safety of citizens and visitors by monitoring public areas using video cameras and advanced picture analysis applications to automatically detect incidents and report them to the authorities. Electric Vehicle Charging is a solution that links the owners of parking spaces (public and private) with energy service providers in order to offer citizens with electric cars a secure and easy way to charge their batteries. The public transport & passenger management system is a sophisticated solution for both the clients and providers of community transport, allowing passengers to plan their journeys more easily. via an easily accessible interface. This will enable city administrators to improve the overall management of their city’s infrastructure. We would like to thank everyone from the DT group as well as our partners from HT for the opportunity to present our solutions on such a grand and important event.